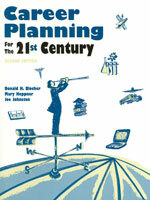 This is not the typical career planning book! Instead of taking you through rote assignments and trying to match you up with “a job,” Career Planning for the Twenty-First Century helps you build a life in which you are living your greatest passions every day, a life of unbelievable richness and meaning. It pushes you to reach deep within yourself for a map to your own unique life journey and then explore the work world in search of places and situations where you can thrive. 7. What in My Life Is Worth Striving For?